Witness Royal Sumikat’s colorful ode to the future of humanity at the Future Tribez mural near Washington Ave. Located amongst a treasure trove of iconic Houston murals within Sawyer Yards in the Washington Avenue Arts District, Future Tribez showcases the strength of human diversity and spirit with its three figures dressed in futuristic eyewear and bold regalias. The three vibrantly colored beings signify how our futures are bright when people of all cultures unite together to fly their flags and colors side by side. The mural is the the creation of Royal Sumikat (@royalshines) with the help of Jesenia Arredondo (@meenr_one). 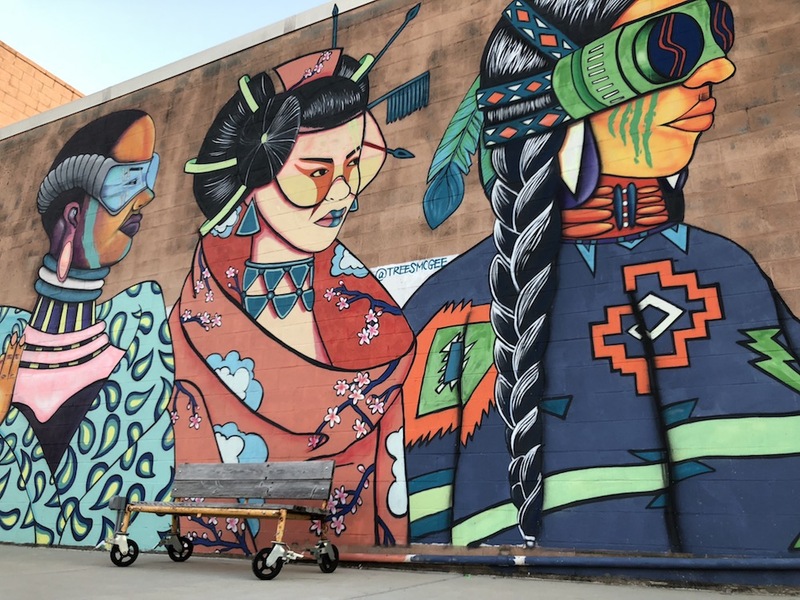 The Houston-based, Philippines-born Sumikat completed the mural in 2016 and dedicated it to her ancestors who have inspired her to be a better person by seeing the world outside of their own experiences. 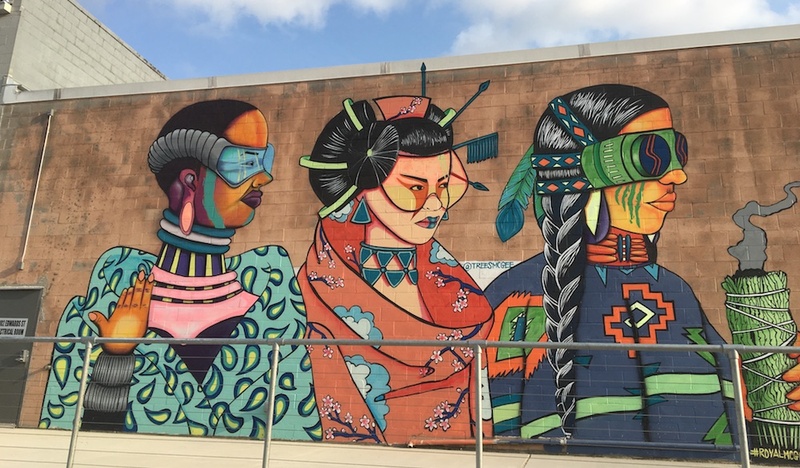 Visitors can find this indigenous-inspired mural at Sawyer Yards, in the lot behind the Silos at Sawyer Yards. The mural is on the backside of the building that houses Holler Brewing Company and Cycle Bar. Use general good judgment when visiting and note that this is located within a property that is officially open 9am to 5pm Monday to Saturday. It is generally accessible on all days of the week, however. Location: Sawyer Yards, 2101 Winter St, Houston, TX 77007, but the mural can be found specifically on the backside of the building that houses Holler Brewing Company and Cycle Bar. If you circle around to the lot behind the Silos at Sawyer Yards, you’ll see spot it, along with many others striking murals. Best Time to Photograph: Arguably, the best time to photograph the mural is in the early morning around sunup or before the sun sets at dusk, when the lighting is warmer. Sawyer Yards is officially open from 9am to 5pm daily, but is closed on Sundays. However, the mural and surrounding parking lots are typically open most days, including Sundays, an into the evenings. Parking: Free lot parking is available in the surrounding area.